We just launched beta 10 of Swapit on Google Play. Over the past weeks, we have been working hard on getting beta 10 out the door before the end of October. Though, it’s November already, we finally made it! You can download it today at! Remember? In beta 9 of Swapit we introduced Facebook group sharing, which we quickly expanded to reach up to 221,000+ members of Facebook groups. In beta 10 we paid a lot of attention to improve the user experience you have there. It is now easier and more straight forward to share your posts to a multitude of Facebook groups with just a few clicks. At the same time, Swapit provides more insight to what exactly happens there and how many people you are actually sharing your item to. Like always, the user interface is beautifully crafted, using Android’s latest Material Design principles. So Swapit comes with the native look and feel all Android users expect. In beta 10 we introduce two premium features to Swapit. Those two premium features are similar in nature and are aimed at helping sellers to sell their items faster. We made it dead simple for everyone to promote their item in our list. At the same time, we pay very much attention to maintain and excel on the user experience we provide for buyers in Swapit. While it is essential to allow sellers on our platform to promote their items, it is also essential to not distract buyers from their original motivation of why they opened the Swapit app in the first place. So we believe, offering a slight highlight of an item in our main item list, is not distracting from the core purpose of our list. In fact, it helps identifying interesting items. FREE. As shown in the screen shot, those two initial premium features are available for free as long as Swapit is in beta. As there is no such thing as a free meal 🙂 we do require the seller to invite at least one friend to Swapit if (s)he wants to use a premium feature. These premium features go on top of the existing offering and therefore, are an addition to the existing basic service of Swapit. Rest assured, none of the existing features are being limited by introducing these premium features. (1) Set Expectations. We’re dropping an anchor (see anchoring) for monetization by showing the future pricing of those premium features. While using such features is free right now, it is very clear that eventually, we will charge for them. (2) Grow Faster. By requiring sellers to invite their friends in order to use such premium features in beta, we are increasing our viral coefficient. That means we will end up with more users inviting their friends and therefore, growing our user base on an accelerated pace. (3) Plan Ahead. We can statistically analyze how many users are using our premium features in general. That helps us a lot in terms of business planning and monetization direction, to more accurately estimate our revenue projections. (4) Know Whats Wanted. We can furthermore, analyze which kinds of premium features sellers are more interested in. Especially in this case, where both premium features are rather similar, it will be interesting to see which one is more preferred by sellers. (5) Effectiveness. At the same time, we can track how effective either the list highlight or the list feature is. In very simple terms, we can compare how many people click on a normal (non-highlight / non-feature) item, how many click on a feature or highlight item. Such data helps to make decisions based on hard metrics on whether to keep those features in Swapit, remove them, revise them and how much to charge for them in the end. So all in all, this current move to introduce a very small selection of premium services in beta, has a lot of advantages. Therefore, we are excited to find out how our sellers and buyers react. I will tell more about our findings right here on our blog. So make sure you’re subscribed. The current Swapit beta 10 also comes with several user experience and interface improvements that aim at making everyone’s life easier. For example, we’ve added each item’s condition and category as a small icon to the item list. That makes it easier to identify whether it’s an item you’re interested in or not. Furthermore, we have received a lot of feedback from our users (thanks a lot to all of you!) and we are constantly applying that feedback into changes we make on Swapit. One of such points was, that new users who want to just quickly post something for sale, didn’t find the “Sell” button. We did initially think it would be pretty obvious as it’s the only big green button on the main list. It’s even round as opposed to most other things on the list that are rectangular shaped. However, especially folks coming from iPhone, had some trouble finding our little green “Sell” button. So we’ve now added a nice tooltip to that with some description to make it super obvious to everyone. Once that “Sell” button has been clicked for the first time, that tooltip will disappear. We’ve also made the “Sell” button automatically float out of the main list screen when scrolling down. This gives the user an absolutely unobstructed view of the whole list while browsing. 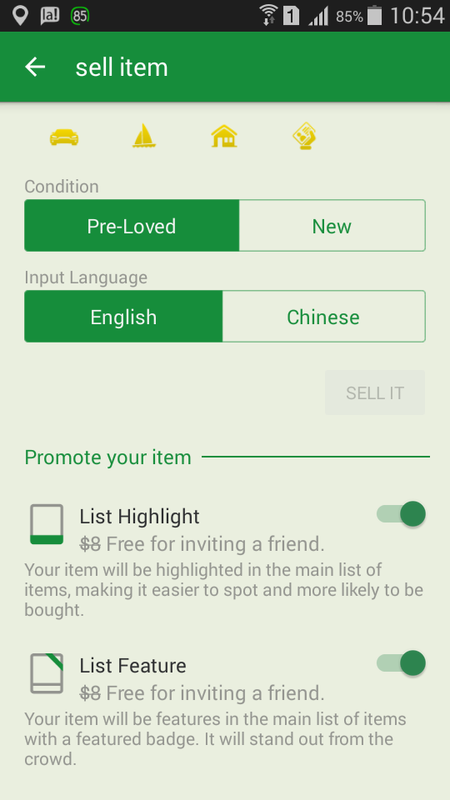 As soon as the user scrolls up, the “Sell” button floats back into the list and you can start offering an item with just a click on that button. That’s it for now. We all hope you’ll enjoy our new Swapit beta 10. If you don’t have Swapit yet, you might want to give it a try. Especially our new premium features are interesting and can be used for free – while in beta. So just head over to http://get.swapit.la and download the app. It’s free. P.S. : Please let us know what you think. We love feedback!